Ahh, the Internet is fascinating. I was about to write my opening sentence for this week’s forecast: “ I feel like I am in the weeds of this lunar cycle,” when I asked myself, “Where did this phrase ‘in the weeds’ come from and does it mean what I think it means?” A short search found this site, The Word Detective, and an illuminating description of the phrase. It’s interesting that this metaphor came up for me as I observe how my Leo New Moon intention* of wholeheartedness has now morphed into a Virgo-like expression of overwhelming emotion and work. I’ll explain. Yes, I meant that too. Into the weeds. This week is the gnarly portion of any lunar cycle, at least for me. From the First Quarter phase to the Full Moon phase, tension builds, which can feel like wanting to give up or to explode from the pressure. It’s not pretty. I take comfort from the hope that the greater the challenges, the greater the rewards are at the end. If I am in the weeds now, it must be that I have a worthwhile goal. You believe that too, right? Wholeheartedness. The image of the Sun card in the Waite-Smith Tarot tells us a lot about wholeheartedness. The child is naked with arms spread wide and trusting their instincts to carry them forward. The posture demonstrates openness and joy. It is an image of simplicity itself. Yet, life creates complications, those weeds, which often make us doubt if we can really achieve that simplicity. With this tension in mind, it is time to look under the surface. Idealized images, although they can inspire, sometimes make it more difficult to stay the course when we are in the weeds. Sometimes we need to look at the flawed pieces and find a way to deal with it. Mars moved into Scorpio last week and will remain in that sign until October 6. 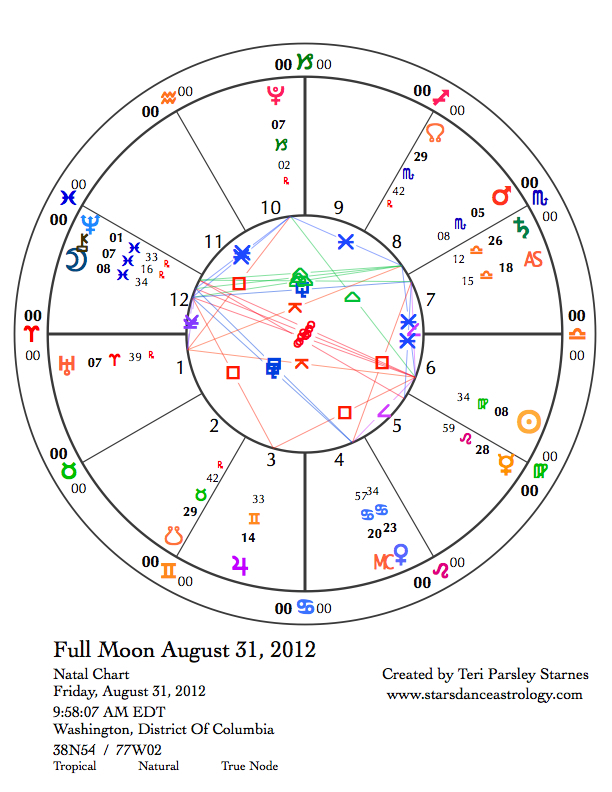 The North node of the Moon (our evolutionary destiny) also moves into Scorpio this week, staying for about 18 months. In October, Saturn moves into Scorpio for a two and a half year stay. This all signals that it is time we got down and looked at our shadows. We don’t have to throw our intentions away, just put them through a tougher examination. Sunday, August 26. All this Scorpio influence right now is creating deeper discomfort due to Pluto (co-ruler of Scorpio) being in hard aspect to Uranus. We feel any challenge from our darker sides more intensely right now because Pluto and Uranus are pushing us relentlessly toward evolutionary change. If we expect the world to change, we also need to change ourselves. Today the Moon in Cardinal Earth sign Capricorn triggers this square between Pluto and Uranus and yes, this feels like more to process. Capricorn is the sign of accountability. Pluto and the Moon join together to demand greater accountability. The fine line to travel: It isn’t about being unworthy of wholeheartedness due to mistakes; it is about being committed to responsibility for one’s actions. Gibbous Moon—Perfecting: August 27. Yesterday’s transits influence this new phase of the lunar cycle. Tensions may play out in relationships, in how women are being treated, and in how we steward our resources. Notice the stakes rising. This is the key to the Gibbous phase: It feels very important to get things right. The serious quality of the Capricorn Moon feeds this desire. Perhaps you are being called to commit to action on behalf of the wholeheartedness of others. Tuesday, August 28. The morning may be solemn, but by the afternoon there is a shift as the Moon enters Air sign Aquarius. Pent up energy can be released by sharing ideals and visions. Dream up innovations. But there is an edge to the day. Notice your reactions to obstruction. This may be the tension between the desire for transparency and for privacy. How much do you want to push for consensus? How much do you want to tune out the collective? Wednesday, August 29. This is a brighter day. We find solutions, ways to express ourselves, and make connections with others. Look for an ally or inspiration on your lunar cycle intention. This may come from an unexpected source. We seem to get out of the weeds for a bit. Notice what helps you find your way. Thursday, August 30. The Republican National Convention ends on a day of contrasts. It will be hard to contain radical energy. The Moon is in Aquarius early in the day and the Sun and Uranus (co-ruler of Aquarius) are in dissonance. 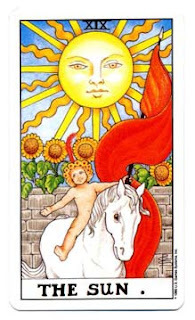 The Sun in Virgo wants to be careful and effective. The Uranian energy wants evidence of revolution and could care less about being careful. We can see this conflict played out in the world, but how does it feel to welcome both of these qualities inside you? After a highly energetic start, the Moon moves into Pisces and connects with Neptune. Ideals can be foggy; it may be hard to keep a clear head as we are swept up in the emotional energy of those around us. There may be a hurricane this week hitting the area around the convention. Is this a metaphor for emotional power? How do we navigate this energy with mindfulness and intention? Full Moon: Illuminating—August 31. 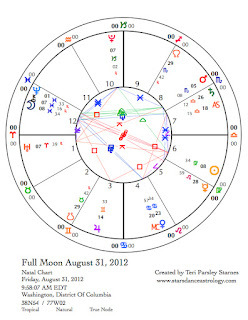 No planets escape having a challenging aspect in the chart for this Full Moon. It is a big energy time. At the New Moon, I wrote: “What does it feel like to experience the strength of creative flow, to know one’s impact, and take responsibility for it, to generously affirm the joy of existence for all?” I want to remember that question as we enter the storm. It seems the lesson of this Full Moon in Pisces with the Sun in Virgo is: How do I discern—a Virgo quality—what feeds my intention of wholeheartedness and what takes me off-track, into the weeds? As the election nears, we will see and hear alarming things. The potential tensions of this Full Moon will manifest and we will be called upon to open-heartedly remain true to ourselves. When the Virgo attention to detail becomes overwhelming, the sign of Pisces is a helpful balance. The Moon today in Pisces joins with Neptune and Chiron: We want to believe that we are more alike than different. We want to trust our feelings and have faith that healing is possible. However hopeless the situation seems, just that collective desire for heart connection can restore us. Correction: For Thursday's entry, it should read, The Republican National Convention ENDS on a day of contrasts.